In the developing world today an ever growing number of countries have sustained economic growth and democracy for some time, and yet find that economic and political inclusion remains elusive for many poor and disenfranchised citizens. This is where ESID research comes in. ESID is interested in the dynamics that bring about transition from limited access to open access political orders, the political and social outcomes of economic development, and the policies that promote and ensure social justice, even in seemingly unpromising contexts. Our ultimate aspiration is to change how development practitioners and scholars think about inclusion, capacity and commitment. 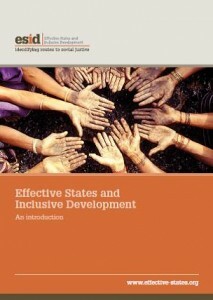 What capacities enable states to help deliver inclusive development? What shapes elite commitment to delivering inclusive development and state effectiveness? Under what conditions do developmental forms of state capacity and elite commitment emerge and become sustained? In particular, what is the role of power relations and ideas? It is the ‘how’ – and not so much the ‘what’– of development that interests us. To read more about our approach, download Effective States and Inclusive Development: An Introduction (pdf).